Dennis Prager has 1 media appearance. Dennis Prager discusses Think a Second Time. 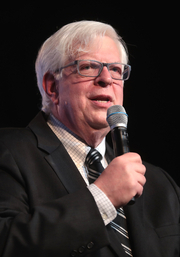 Dennis Prager is a syndicated radio talk show host, columnist, author, and public speaker noted for his conservative political and social views. Dennis Prager is currently considered a "single author." If one or more works are by a distinct, homonymous authors, go ahead and split the author. Dennis Prager is composed of 2 names. You can examine and separate out names.